A new report by Arakan Oil Watch (AOW) called “Danger Zone” alleges that a planned Chinese industrial zone threatens the livelihoods of tens of thousands of people in Arakan State as well as Burma’s second largest mangrove forest. Arakan Oil Watch (AOW) is a community-based, non-governmental organization monitoring the impact of multinational oil and gas projects on locals inside Burma. 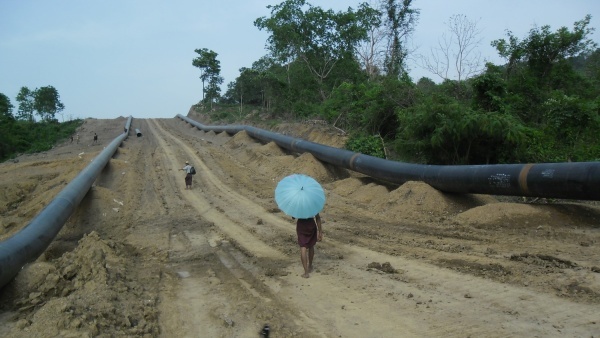 China’s construction of the pipelines and a deep seaport has “already caused large-scale land confiscation in Kyauk Phyu,” the group said in a statement. The US$109 billion project involves China’s CITIC Group, Japan’s Nippon Koei and Burma’s Htoo Trading, but no comprehensive project plans have been presented by the government to affected communities or local politicians. “What is the government thinking – handing over our pristine coastlands to foreign companies to turn into a toxic industrial zone?” said Jockai Khaing, Director of Arakan Oil Watch in the statement. The project also includes an 800km railway and highway from Arakan State to Yunnan, expanding the pipeline corridor across Burma. China will build and operate the railway for 50 years before handing over control to Burma’s government. “China’s projects will uproot tens of thousands of people in Arakan State and spark conflict. Burma’s government and investing companies should learn from what is happening at the Monywa copper mines,” said Jockai Khaing. Arakan Oil Watch is calling for community consultations, stringent regulations, and laws to protect the people and environment before projects such as the Kyauk Phyu Special Economic Zone go ahead.